In small town America, getting your name, or better yet your picture, in the paper is one way to ensure your fame. “Famous in a Small Town,” words by Miranda Lambert in a chart-topping country song, touts the little things that bring fame, including cheering for the home team on Friday nights and getting the first buck of the season. Even if you are just a kid, recognition by adults and the local paper elevates one’s stature to relevance in history. This week’s relevance begins with the Comal County Junior Livestock Show Association. Agriculture has been around since nomadic tribes settled down. Since that time, livestock judging has been a critical skill used by butchers to judge how many cuts of meat they can get or breeders to judge what genetic traits are most desirable for for meat production. In the 1950s, more scientific livestock judging became big business, with grand champion animals commanding top dollar for breeding. Livestock judging in Comal County happened in places like the county fair. Junior livestock judging came along when organizations like 4-H and FFA (chartered in Texas in 1908 and 1929, respectively) were created to provide agriculture education and leadership skills. 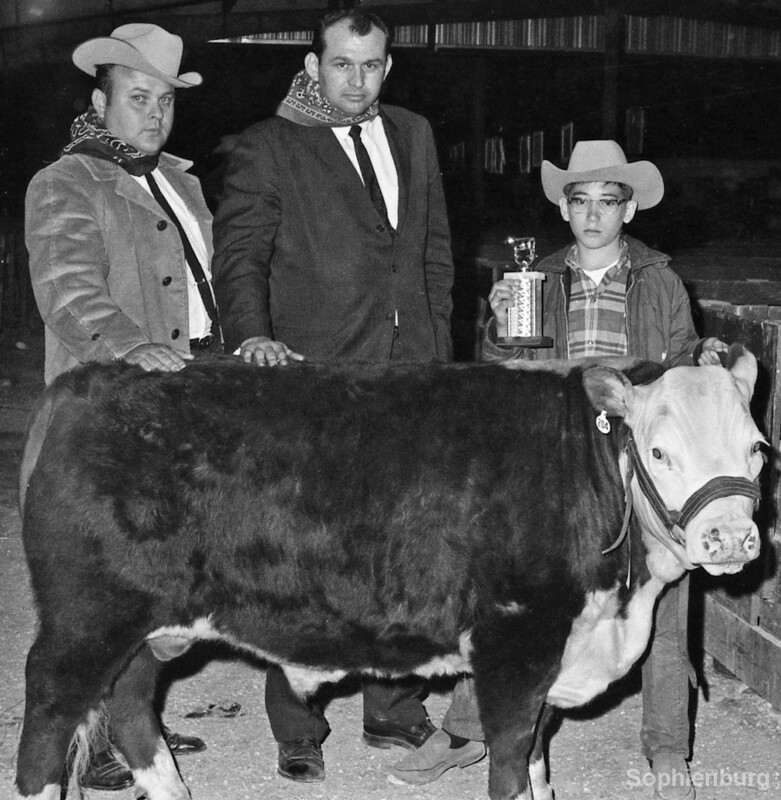 In 1968, in an effort to stimulate more auction bidders and increase participation by the youths, County Extension Agent Bill Schumann, the local ag teachers and others came up with a new idea, and the Comal County Junior Livestock Association was born. The group developed a point system where the kids get more money from showing, something that had never been done before. After taking care of the grand and reserve champion calves, lambs and hogs, money generated by the auction would be distributed based on points assigned to each ribbon and winner position. The guaranteed cash award for the grand champion calf that first year was $50. Grand champion lamb and hog guaranteed $35 each. (You could not even buy a bag of show feed for that price today.) There were 286 livestock entries: 77 sheep, 70 cattle (five of which were bulls), 60 swine, 29 rabbits, 23 Angora goats, 15 poultry and 12 horses. The grand champion calf was shown by Mike Jonas. Today, 50 years later, CCJLSA is one of the healthiest junior livestock shows in the state with a point system that few others have adopted. Last year the auction earned just under a million dollars which was distributed in the form of exhibitor winnings and $15,000 in scholarships. Countless kids, ages 9 to 18, have passed through these programs designed to develop personal growth, leadership skills and career success. Carl Hoffmann, CCJLSA president, was in 4-H from 1975 to 1987 under County Extension Agent Bill Schumann and Mike Barber. The show has grown and changed over the past fifty years. They have doubled in size and the Grand champion steer brings nearly $10,000. This year the association expects approximately 523 livestock entries, including: 122 sheep, 98 cattle; and 317 swine, 100 rabbits, 160 goats, and 139 poultry. The Comal County Youth Homemaking and Art Fair, while operating separately, has taken place at the same time as the livestock show. It includes science, industrial arts and homemaking projects and is open to students in 4-H, FFA, homemaking and art classes. In 1968 the Homemaking Fair had 623 entries, 149 of which were clothing projects and 110 were cakes. Grand champion cake entry was Margie Laue. The Homemaking and Art Fair also adopted a point system in recent years to aid their auction and benefit the exhibitors. Many of the volunteers involved in coordinating and judging the show have a long history with 4-H and the homemaking show. Debra Koepp, chairman, expects more than 500 entries in the homemaking division this year with approximately 125 kids participating. The numbers have fallen since 1968 but are making a comeback. The sewing entries have really dropped off mostly due to homemaking classes not really being offered at the schools any more. Besides 4-H and FFA, Boy Scouts, Girls Scouts and home-schooled students are welcome to participate. Shirley Kivlin, one of the show superintendents, has been involved with 4-H for nearly 60 years, first showing, then mentoring, helping her own children or judging baked goods. Of her years of giving back, she says, “The 4-H motto is ‘To make the best better’ and that’s my goal. Through their projects, the kids get involved, learn life skills, and earn money for college.” A grand champion cake can bring $1,000. Famous in a small town? You bet! New Braunfels exceeded the 50,000 population that typically defines “small town” some time back, but that means our youth can get that much more support for what they do. This year’s Comal County Junior Livestock Show dates are February 28 through March 2 at the Comal County Fair Grounds. The sale starts at 8 a.m. on March 3 and usually runs all day. The Homemaking and Arts Fair is March 2. The live auction begins Friday at 6:30 p.m., but entries not making sale can be purchased between 2:30 and 4:30 p.m. Whether you are at the auction to buy or just to watch, you will make someone feel famous and relevant. March 28, 1968, New Braunfels Herald-Zeitung: High Bidder on the medium weight champion steer was A&P Food Store, who paid a fat 33 cents a pound for Darrell Moeller’s steer. Shown with their buy are John Whitworth, local A&P manager, left, and Lewis Newell, A&P meat supervisor from Austin. Darrell holds the trophy his steer won.